On the weekend I headed down for a weekend of shopping and blogging in Bristol, it’s only 2 hours on the train from Plymouth and when a blogger event comes up that isn’t in London, then a) it’s a miracle and b) something that cant be missed! Joe Blogs Network organised the event, you’ve probably spotted @joesbloggers on your twitter feed at some point, they are a great network for bloggers and have lots of fab opportunities and events always in the pipeline, I’ve always had to turn down invites before as the locations of the events have been too far for me to travel. However, this time I was in luck, and a day of crafting with Laura Ashley and their beautiful fabrics and wallpapers were in store for me and all of the other lovely bloggers that attended the event. The event was held at At Bristol which is like a massive science museum really, so much fun and definitely worth a visit if you ever get a chance. I headed into the lift and was transported upstairs to the room that the event would be held in. 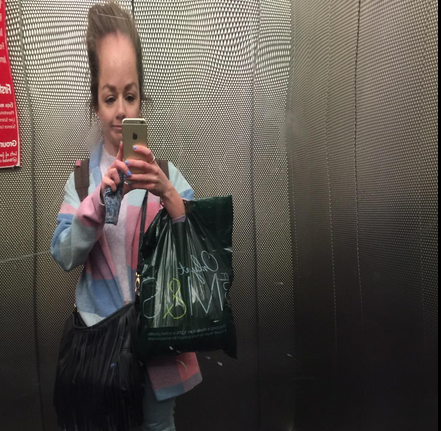 It was such a great venue, and I had fun as soon as I stepped into the lift, does my head look big in this? 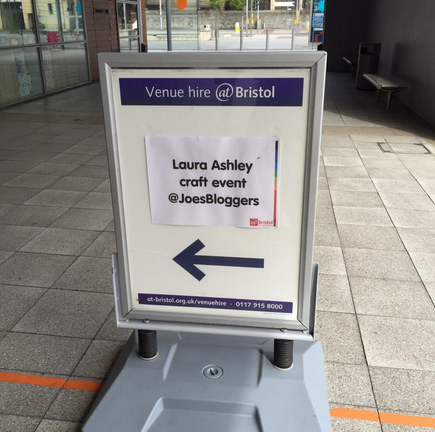 We were greeted by the Joe Blogs team, Laura Ashley and The Crafty Hen who organise crafting workshops and were running the #LauraAshleyCrafts workshop for the day. The first bit of crafting for the day was decorating a notebook with Laura Ashley summer fabrics and wallpapers, and adding embellishments with all the other pretty ribbons and buttons that they had laid out for us. The Crafty Hen team were on hand to guide us through each step and to step in and help with any tricky techniques! I’ve never seen a room full of so many pretty ‘Laura Ashley’ esque dresses, there was a quick rush to the fabrics to choose which ones we wanted for our notebooks, it was one of those bees swarming to the honey pot moments! I opted for pink (of course!) stripey fabric and a lovely floral wallpaper, as well as the cutest pastel pink buttons. 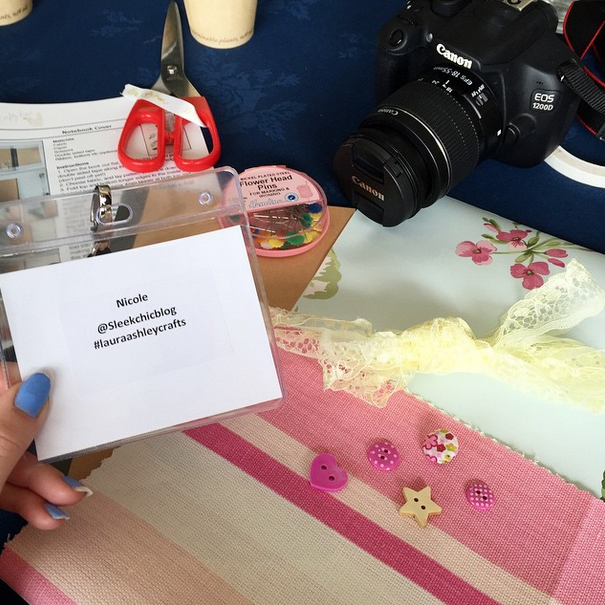 The bloggers were all hard at work, doing their thing – Instagramming, chatting and crafting! My finished notebook! I added a little corsage to it that I made with a simple running stitch on some lacy ribbon and attached some ribbon onto the notebook too, I think it looks so cute and is very ‘me’, I’d like to think I would resemble something pastel coloured if I was an object. I think its definitely going to be my new blogging notebook, I have so much catching up on blogging to do! All of the bloggers finished notebooks, so many pretty pastels and florals, and I love everyone’s different takes on decorating their notebook. There were also Laura Ashley prizes for the most creative notebook and accessory! We had a quick break for lunch and we were then onto creating Suffolk puff accessories! They are sooo easy to make and you really didn’t need any previous sewing skills to make these. We were all fully immersed in crafting, I absolutely love crafts but with work/blogging and every day life I just don’t have any time to enjoy it anymore so it was amazing to be given the opportunity to have a day devoted to it, with the help of Laura Ashley and The Crafty Hen! I made this adorable suffolk puff brooch which is just the cutest, I love the matching ribbon and button! It will take pride of place on my notice board where I keep all of my blogging bits to look back on. Some bloggers made some fantastic hair pieces which would definitely not have looked out of place in their hair at the races! Having the pleasure to use such beautiful fabrics and wallpaper was generous enough, it was so kind of them to also put together a little goody bag for us each to take home, which contained a lovely soap and hand cream stand and their catalogue, my mum was ecstatic when I also brought her home some of the leftover Laura Ashley material! It was then time for a group picture with everyone and I left with a big smile on my face having made some more blogging friends and had the chance to use some beautiful materials to get creative with! A massive thank you again to Joe Blogs Network, Laura Ashley and The Crafty Hen for such a fabulous crafternoon and for inviting me along! Laura Ashley have also written a great blog post on the day too that you can view here. 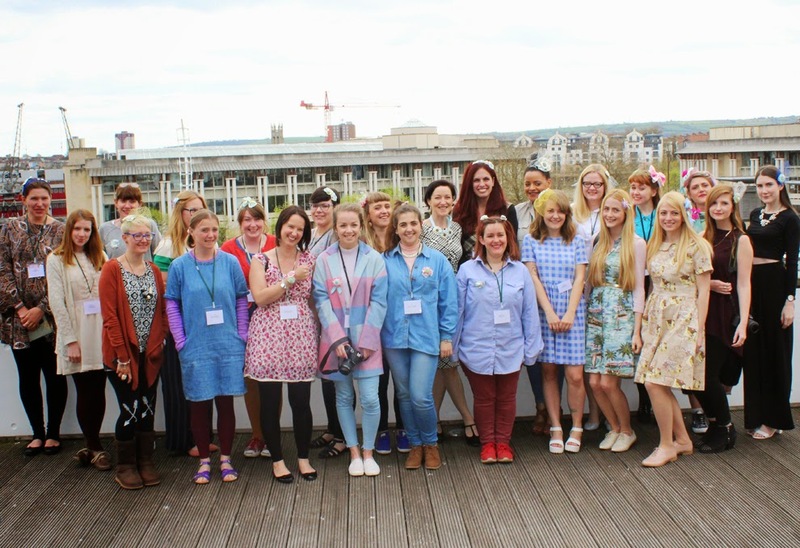 It wouldn’t have been the same without meeting all of these other lovely bloggers too, I’m really looking forward to more events like this in the future, that are slightly closer to home! Did you attend this event? (Link me up to your post if you did, I would love to have a read!) Do you like Laura Ashley fabrics? Would you have a go at making these things? Previous Post St Helen’s Farm – Why not give Goats’ a go? Next Post The Stable Plymouth – Pizza, Pies & Cider!